Writing, Surviving & Thriving: One Day . . . When I was on campus yesterday, my advisor started talking about how she and her husband went to see Life of Pi over the weekend. I said I wasn't going to see the movie until I read the book, but given that I rarely read for leisure these days, I just don't think that's gonna happen. Hubs bought the Blu Ray, and I want to watch it. Thinking about how I rarely read books for leisure anymore made me think about all of the other things that I want to do once this wear-out called graduate school is over. And so on this hump day, I present some of the things that I daydream about doing once I defend this dissertation. 2. Take a ballet class - Years ago, I used to dance - tap, jazz, high kick (for real), lyrical. 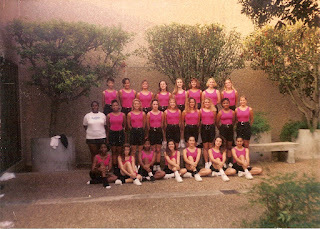 I was even a lieutenant on my high school's dance team. I can't wait to slip back into a pair of dance shoes and leap and twirl. See that first little chocolate drop seated on the first row? Yup, that's me! 3. Re-take some high-level math courses and enroll in a few world religion courses - This will probably happen once there's been some good distance between me and the doctoral program. I want to do them at my own leisure, minus the pressure of grades and pleasing a professor. I just wanna do it for the love of knowing more. 4. Use all of the cool kitchen gadgets we got for our wedding - We use a lot of them, but some of them haven't even been unpacked. 6. Shop for "real clothes" again - The laid-backness of grad school is nice, but I can't wait to dress for success again. I was a teacher who wore suits and heels to work, and I plan to be just as sharp in my next position. 7. Hang out more with my girlfriends - We hang out now, and I see some more than others, but I don't see any of them as much as I'd like. 8. Travel - Hubs just sent me a link to a cool concert in the UK this summer. I'm planning to go dissertation free! 9. Get Invisalign - As soon as I'm done and I'm back in the world of work, I want to straighten my teeth. I've been for the consultation, and I'm ready! 10. Get back into wearing makeup - between writing and exercising, I don't get the opportunity to get glammed up as much as I'd like. I plan to revamp my look when I'm all done. These are a few of my ever-expanding list of "to dos." But as the saying goes, I'm doing what I have to do in order to do what I want to do in the future. What about you? What kinds of things are on your "one day" list? Until next time . . . I'm off to do what I have to do. I would like to sit around and watch TV (without guilt) once my dissertation is done. Love this! I need to find my list. I think it's buried under student papers somewhere. Keep grinding, my sister. You are almost THERE!! !